Arc is one of the types of gas arc discharge. Gas arc discharge performance as the electrode voltage is very low, but by the current of the gas is large, a dazzling white light, high temperature (5000 k) arc zone. Huge thermionic emission from the cathode current density, as well as electronic since the launch, which has positive ion layer near the cathode, form a strong electric field, the cathode emission electron automatically. A large number of electrons in the interelectrode gaseous molecule collision ionization, produce greater amounts of positive ions and secondary electron, under the effect of electric field, the impact of cathode and anode, respectively, the results for high temperature. Cathode electron emission energy to get through, so the temperature is lower than the anode. Electrode was part of the positive ions and electrons composite heat release and heat generation. Electric arc furnace is using the principle of metal smelting furnace. Under the environment of vacuum arc furnace is vacuum arc furnace. The vacuum hot pressing sintering furnace, vacuum arc smelting with high current, low voltage operation, belongs to the short arc. General electric arc voltage for the 22 ~ 65 v, corresponding to the arc length of 20 ~ 50 mm (the latter for big ingot). From smelting white gold experiment success since 1839, in the later one hundred years people started to research of refractory metal smelting. 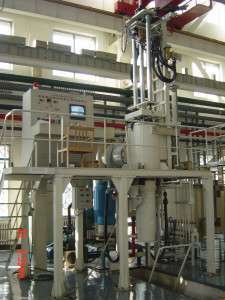 Vacuum arc furnace in 1953 will be officially used in industry. Until 1956, the United States and many European countries still use the self-consuming furnace melting titanium, began in 1955 with the self-consuming furnace steelmaking. Around 1960 self-consuming furnace production has reached more than 30 – ton ingot, begun to take shape. Now in order to improve the productivity and improve equipment utilization, two vacuum furnace share a set of main power, vacuum system and automatic control system. Under vacuum heat treatment, the workpiece (or material) can improve the worker, mould service life, no oxidation, no decarburization, surface brightness, small deformation, pollution-free, to save energy and change the mechanical properties and metallurgical properties, etc.